A nagging question as the year gets closer to the very end. The wind is there. The water is there. The sun is there. How is it that we are still so far off in fossil-fuel land? Farms, plants, rigs later, those in the renewables industry know the answer. A video from Quartz back in August said, "There's been a lot of progress in renewable energy with solar and wind power, but renewable energy storage remains a challenge." TechCrunch's Jonathan Shieber is no less frustrated at the difficult-of-it-all: "Because solar and wind power are now cheaper to produce than energy from fossil fuels, the only obstacle that remains to the mass adoption of renewable power is the amount of money utilities need to spend to store the energy those systems produce." Considering the worrying over climate change, he added, an attempt to find a solution "that can make renewables even more compelling and cost-effective isn't just a good business—it's a global priority." "Renewables have struggled to more fully replace fossil fuel power due to production unpredictability and intermittency from reliance on factors such as wind and sunlight. In the absence of more efficient and cost-effective storage, "the amount of electricity that can be delivered to the grid from renewable energy sources, even though now widely affordable, has been limited," said a company release from Energy Vault. The storage problem, though, will not stay as a roadblock for long. Energy Vault's recipe for a concrete battery is gaining interest and indicates the problem of storage is much in focus. Take kinetic energy and concrete bricks—and voila. Kelly Pickerel, editor in chief of Solar Power World, reported that "an Idealab company that develops renewable energy storage products," referring to Energy Vault, announced on Nov. 7 the commercial availability of its solution for energy storage. 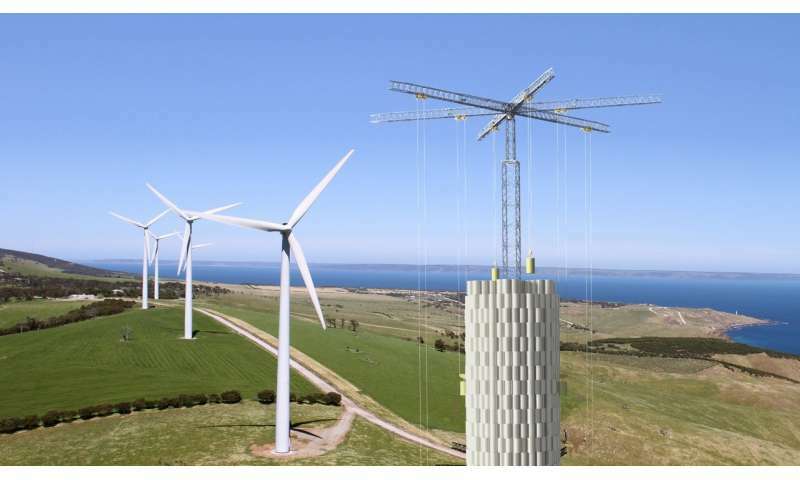 Their proposed solution for energy storage involves a crane, software and concrete blocks. Pickerel described "conventional physics fundamentals of potential and kinetic energy" in place together with a "proprietary, cloud-based software platform" to operate a six-arm crane. The crane operation, which is automated, orchestrates the positioning of the concrete bricks. The crane moves massive concrete bricks "that provide the basis for the efficient storage and discharge of electricity." The video about their solution says the concept is similar to that of hydroelectric power, where energy is stored by pumping water to an elevated reservoir and recovered by letting that water fall and turn turbines. Energy Vault's idea is similar to hydroelectric power, but instead of using water and dams, it uses the concrete blocks and cranes. This is utility-scale energy storage. A key company pitch is "economic benefits to global energy providers." The bricks do not degrade over time, like chemical storage solutions. The company claimed that with this technology, it would be delivering a 30-40 year life without any degradation in storage capacity. Commenting on that lifetime number, TechCrunch said "the technology relies on mechanical energy from incredibly durable materials." The company highlighted the advantage of bricks not degrading over time—so that means less outlay and worries over replacement equipment. "Future systems will roughly double the amount of MWh energy storage capacity and peak power discharge while continuing to significantly reduce the cost." Another pitch is that takers need not abandon their other forms of alternative energy. Their storage tech can be "paired with renewable generation like solar PV for offgrid and microgrid solutions, allowing commercial and industrial customers to maximize their renewable power usage," said the company news release. The makers are using recycled concrete that was only going to be landfilled—instead of new cement construction, according to TechCrunch. Adele Peters in Fast Company made a similar observation that the bricks "can be made from cement that would normally be wasted." Peters quoted Robert Piconi, CEO. "These materials we're using are actually materials that you'd have to landfill." Peters reflected on waste and cost issues, giving California as an example, where "a construction site with concrete debris has to pay as much as $55 a cubic yard to get rid of it." The team decided to use recycled cement to make the blocks that its energy storage system would use. The creators referred to some "nifty software" to maximize efficiency. This is their algorithm-based software, which plays a role in getting this whole concept to work. The news release said that it "calibrates the energy storage and subsequent electricity discharge while accounting for a variety of factors, including power supply, energy demand volatility, and weather." Specifically, it's a software system that manages the movement of the cement blocks, wrote Schiever, " to either store the energy generated by solar or wind farms, or discharge that energy onto the power grid." What's next? The company announced an agreement with The Tata Power Company Limited, an integrated power company in India, to deploy an initial 35 MWh Energy Vault system. Deployment was expected in 2019, according to the announcement. The company also announced a technology and commercial partnership with a Swiss subsidiary of Mexico-based CEMEX, CEMEX Research Group AG. World Cement describes CEMEX as a building materials company. I don't think it makes sense. It takes elementary school calculation to find that it would take approximately 4 metric tonnes with altitude change of 100 meters to store 1kWh. Or 4,000 tonnes for 1 MWh. Or 4,000,000 tonnes for 1GWh - the small grid scale. This will be almost 2 cubic kilometers of concrete, lifted 100 meters. @NoStrings - you calculations are correct as far as they go, but what is what is most important is the volume required. One metric ton of concrete occupies about .45 cubic meters. 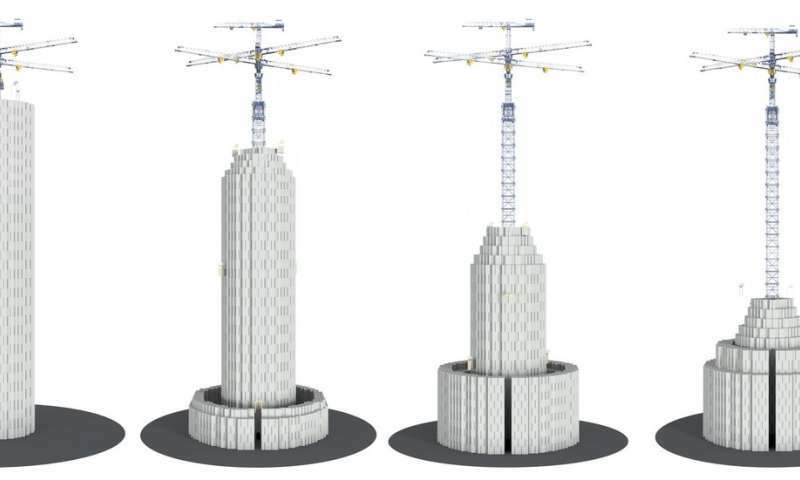 For a 50m circle, that is 2k cubic meters per meter of rise or 1kw per 2 meter stack height. Since even really large towers of a couple of hundred meter or more ht rarely generate more than 5kw/hr, you can easily store several hours of generation using this technique. You are right Parsec. I misspoke. 2 square kilometers one meter thick for 1GWh. Still a lot, but this is done already with water reservoirs. Love this idea! So cheap and simple and can be built almost anywhere. Sun Moves From East to West and What is West is East for some other Location. So, Make a Series of Abundant MOVING, Floating Solar Panels that follow the Sun on Oceans fortified with appropriate Batteries . What is needed is Cooperation & Coordination among Various Nations. They have to participate & pay for the help. Also, Ships passing nearby can Transfer their Discharged Batteries to these Solar Panels and pick up Fully Charged Batteries from them ! With Our Advanced Computer System, All of This is Possible ! Initial investment will certainly work with FOREVER Dividends. No doubt about it ! Also, Ships passing nearby can Transfer their Discharged Batteries to these Solar Panels and pick up Fully Charged Batteries from them ! With Our Advanced Computer System, All of This is Possible ! Initial investment will certainly work with FOREVER Dividends. No doubt about it ! Similarly, unbreakable (Since Whales have huge teeth), GIGANTIC, Plastic Pouches with Marine algae inside floating in the oceans FOREVER until they are collected and turned into Biofuel will also add to our needed energy. Once, they are ready to be collected, the nation that gets it should pay for it. Just keep making them and keep reusing them. What all needed is some water inside them and a way to discharge the released Oxygen into the water from time to time. Just Make sure that they will never sink to the bottom of the ocean and their surface is slippery. Again, Cooperation and Coordination among nations are needed. Good Computer system should ensure that the entire process will be error free ! Just use Hypersonic Planes to fly charged batteries (from where the Sun is still shining) to areas/nations needed and get discharged batteries from them (where Sun has already set) in return. Initial investment will pay off soon. Huge Industries that are hungry for cheap energy supply will certainly pay for them. Just make it an International Endeavor. Also, Ships already on the Sea Water should also be able to grab charged batteries around them & discharged batteries for transport around the world ! It appears that the plan will suffer from wear, high maintenance costs and metal fatigue. The real problem with renewable energy storage is the amount of power that must be stored in order to totally replace other plants. We are not talking about hours here but weeks. Otherwise one still needs nuclear and fossil plants to be manned and able to run in order to provide backup. Thus the costs of the less utilized backup plans still need to be added to the renewable generation costs. Just this year England had a "wind drought" and for about 2 weeks and there was little or no wind power generated. Renewables and storage are useful but they will never be ab;e to supply 100% of the 24/7 power needed by a country. In theory if renewables became cheap enough then they could be used to produce liquid fuels which then could be stored in tanks and used as needed for transportation or electric generation. That is the only way I can see a 100% renewable future. Batteries would have to be made out of a very common element in order to be cheap enough to be economically feasible. FYI, from what I understand, LI-ION batteries are not recyclable into new LI-ION batteries. Thus there is not enough Li in the world to make them a source of backup power. It takes as much energy to pump water to a height as is derived letting it fall and turn generators. Hydroelectric systems rely on the process of evaporation of water by sunlight and rain into reservoirs to provide energy. The hydroelectric system supposedly does nothing to make water evaporate then rain, all the energy it gets is free. This system takes energy provided by "alternative energy" systems, puts that into the work of raising the concrete blocks, then harvests no more than that amount of energy, and likely less. And, meanwhile, there are those likely to be deprived of energy on a regular basis by having it put to work raising the blocks. And it can store no more energy than the height of the tower. An example of how recklessly unthinking propaganda like "fossil fuels" and "climate change" can make many people. It's chemtrails that cause the depraving of the weather. Part time power generation has little place in a 21 century economy. Similarly, unbreakable (Since Whales have huge teeth), GIGANTIC, Plastic Pouches with Marine algae inside floating in the oceans FOREVER until they are collected and turned into Biofuel will also add to our needed energy. Once, they are ready to be collected, the nation that gets it should pay for it. Just keep making them and keep reusing them. ! Short term wind energy storage is indeed very important. Why not just reinforce the turbine towers, and use concrete rings around the base. Lifting and dropping could be done with modified gearing of primary turbine gear system, eliminating loss from electrical conversion for storage. Simplifies electric distribution also. (was mulling this over driving through the big wind farms beween Indy and Chicago). Existing turbine towers already have a massive reinforced concrete base, so construction would not be much more expensive. ... Also... How about using the concrete rings as flywheels for additional energy storage! No reason this couldn't be done with giant water reservoirs. But more importantly. There are batteries for storage that are made out of common materials. Sodium and potassium. Also fuel manufacture is a viable solution. It is really just a matter of infrastructure, scaling up, and time now. Using the same principle, why not use renewable energy to stretch something like a giant rubberband(s) or a McDonalds wind up toy. smaller footprint.